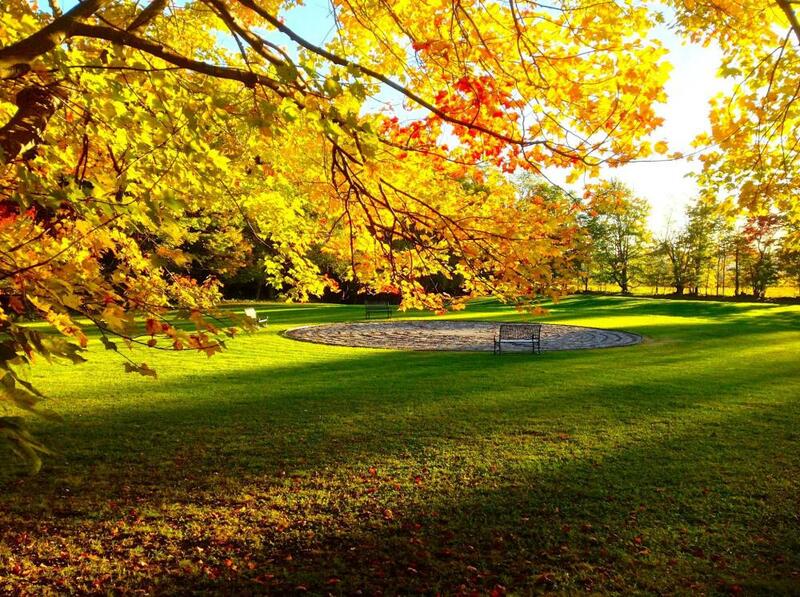 Located in central New York, Harmony Hill is a gorgeous 70 acre property situated on the Catskill Mountains. If you are searching for unique camping accommodations that aren’t lacking in the comfort department, these Glamping Treehouse Yurts could be your perfect destination! There are tons of opportunities for outdoor recreation in the area, and if you’re looking for a beautiful place to relax, you won’t be disappointed in the mountain views! Love privacy, unique lodgings, and amazing sights? Harmony Hill features two amazing Glamping Treehouse Yurts, perfect for solo travelers and couples, and a lovely Chalet Mountain Cabin for larger groups. 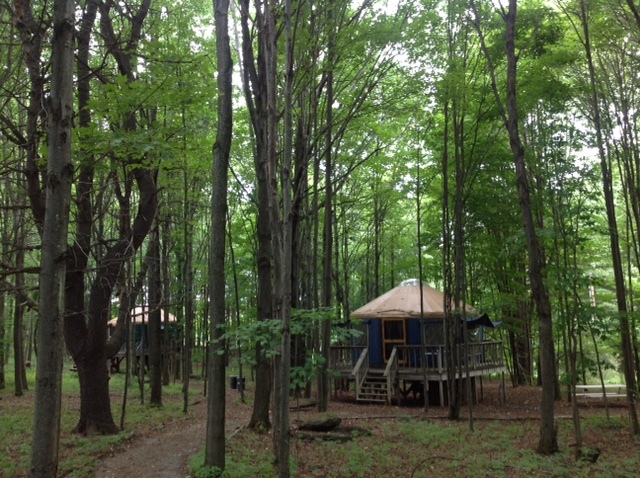 The Treehouse Yurts boast king beds, comfy chairs, a fully equipped kitchen, a modern bathroom, and a spacious deck. Grill up some burgers and enjoy the quiet of the forest around the campfire after a long day of adventure. 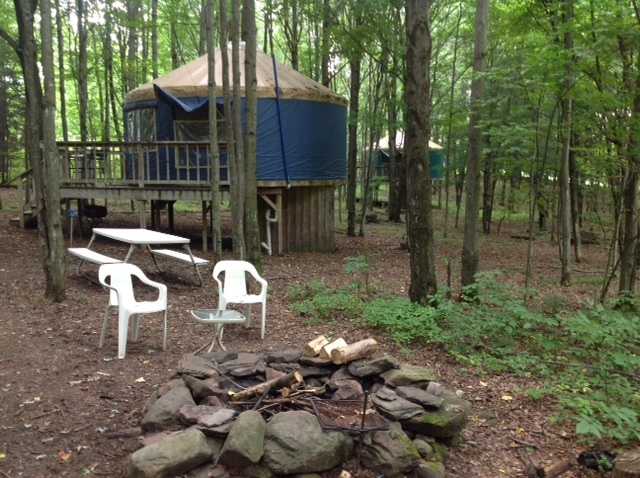 Campers love the dome sky light, French doors, and the overall luxury of the yurts. 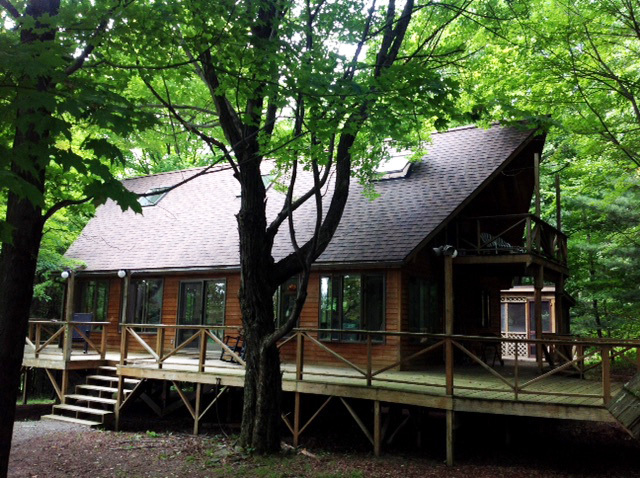 The post and beam Mountain Chalet Cabin can comfortably accommodate up to 6 people. Open and spacious, guests enjoy a great room, sleeping loft, media area, fully equipped kitchen, washer/dryer, large bathroom, and the beautiful surround deck and screened in porch. Campers have awesome views of the forest, meadow, and mountains. After a day of exploring, stretch out on a blanket and bask in the gorgeous starry sky. Ready for an adventure? The options are endless for outdoor recreation in this area. From canoe and kayaking to hiking and horseback riding, there are plenty of ways to get outside and take in the stunning views. Popular destinations in the region include Stone and Thistle Farm, Hobart Book Village, Bear Pond Winery, Brewery Ommegang, Howe Caverns, and New York ZipLine Tours. Ready to plan your New York camping trip? Harmony Hill, nestled in the Catskill Mountains, is perfect for relaxing, outdoor adventure, and experiencing the luxury of a unique glamping destination. Book your stay today on Camp Native!